Your Definitive Guide to Taking Care of Your Dog’s Teeth! Did you know that tooth decay in dogs is a really big problem!? The thing is that dogs use their teeth for everything—from showing love and affection to eating, holding things, etc. and your dog’s teeth are really important parts of their body. We, as humans, have hands that we use to do most of our stuff, but, in the case of dogs, they only have their teeth. So, in this blog post, I’ll be going through your dog’s teeth, how to take care of them, common problems, etc. Did you know that just like humans, dogs, too, have two sets of teeth throughout their lives? By the age of six weeks, a puppy has 28 teeth in its mouth! 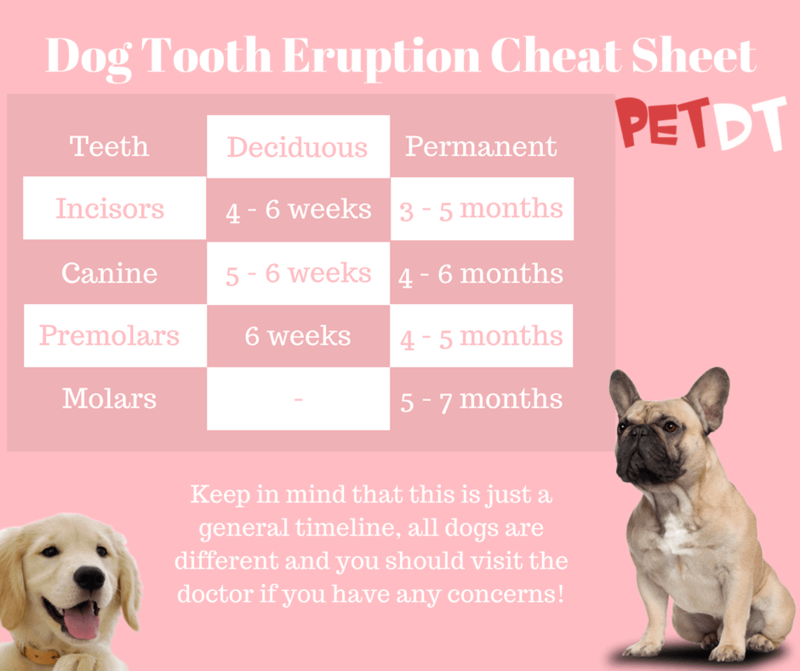 Of course, these 28 teeth do not include molars or premolars since the puppy doesn’t really need to do any grinding in the first few weeks of his life as he sustains mainly on its mother’s milk and other soft food. So, what happens to these baby teeth? Well, puppies start shedding these baby teeth by the age of 4 months. 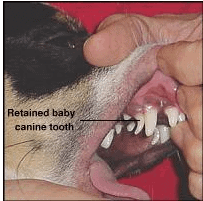 Some of the baby teeth don’t shed and are still present in your dog’s mouth. An adult doggy has 42 teeth—but this number of teeth usually depends on the breed of the dog—some large breeds are known to have more teeth. So, in this section of the article, I’ve decided to talk about teething and how the process of teething takes place. Teething is an extremely frustrating time for your dog. I recommend that you invest in some of the best chew toys for puppies to save your shoes and furniture from your tiny little ball of fur! For the rerouting purposes, I recommend that you get your dogs some exciting chew toys like the West Paw Design Ball Chew Toy or the Nylabone Dura Chew Knot. I have rounded up the best chew toys for puppies, so you can check them out over here. Let me know in the comments section if it worked for you! In this section of the article, we’ll talk about the anatomy of your dog’s teeth and how evolution played a major role in this. So, we all know that dogs are carnivores, but, we have turned our pet furry friends into omnivores because their feed contains a lot of plant-based material. But, why did I bring up the carnivore thing? Well, since that dogs are carnivores, they have teeth that can tear through flesh and they also support a digestive system that can get nutrients from meat. Your dog’s teeth aren’t just for eating, though! They also help show emotions on your doggy friend’s face. Like, for example, if your dog is angry, chances are that he’ll show you his teeth as a warning sign—some dogs also smile by showing off their teeth when they’re happy. teeth—but that is not usually the case with all dogs as some dogs retain their deciduous teeth. The baby tooth can hamper the permanent tooth’s growth and can even cause it to grow abnormally. Your Dog’s Teeth: The Anatomy! All four of these teeth work together in order to hunt and eat prey! Small teeth in the front of the mouth, just like humans! These teeth aren’t very sharp. Your dog has 6 incisors on the top and another 6 on the bottom. These are the scary-looking sharp teeth on the sides of your dog’s mouth. They are used for tearing the food down. Your doggy friend has two of these on the top and two on the bottom. The molars are used for chewing the food and have the most tartar buildup on them. Your dog has two molars on the bottom of the mouth and two of these on the top. I hope that this section covered the basics well, without it being too technical for you to understand! Let me know in the comments section how you liked it! And, if you have any questions, please feel free to ask! Brushing your dog’s teeth is important. If you are a new dog owner then brushing your dog’s teeth can be a really stressful task—for you and for your furry friend! But, how else can you fight off plaque and dental issues!? In this section of the blog, I’ll go through one of my favorite techniques for brushing my dog’s teeth. Let’s start by talking about the toothbrush. In case you do not have a dog toothbrush, you should pick up a child toothbrush instead as it is better suited for your doggy friend. For the toothbrushes, I recommend the Wyqu Dog Toothbrush set and the Virbac CET Oral Health Kit. As for the toothpaste, never use a human toothpaste for your furry friend! This is because normal toothpaste contain fluoride and other ingredients that are really toxic for your dog! Doggy toothpaste are safe for your dog and come in different flavors that make brushing your dog’s teeth an easy task. The toothpastes that my doggy loves include Petrodex Enzymatic Toothpaste Dog Poultry Flavor and Arm & Hammer Advanced Care Enzymatic Toothpaste for Dogs. Start When Your Puppy Is Young! I’ve said the same thing about grinding your dog’s nails. And, this, too has the same logic as that! The thing is that when you start brushing your dog’s teeth while he’s still young, he’ll get used to it and this will make brushing a pleasant as well as a bonding experience for you as well as your doggy! While we’re at it, I would also recommend you to start grinding your dog’s nails early as well. Your dog needs to get used to the having the toothpaste and the toothbrush in his mouth in order to get comfortable with the brushing. You should always reward and praise your doggy in these tiny steps to make the transition to brushing more comfortable. Start By Brushing a Few Teeth at a Time! One of the biggest mistakes that dog owners make is straightaway brushing all of the dog’s teeth—making the process traumatic for their doggy friend! As I have said before, you should take baby steps while brushing your dog’s teeth. And, so, you should start off by brushing the front few teeth of your dog and work your way back gradually over a span of a few days. We have one ultimate goal: consistently brushing your dog’s teeth in order to avoid any dental problems. And so, we should not just brush the dog’s teeth once in a blue moon—that simply won’t work! Try to brush your dog’s teeth regularly and try to turn it into a routine. Did you know that about 85 percent of dogs over 4 years of age are plagued with gum disease? And, that’s not even all! 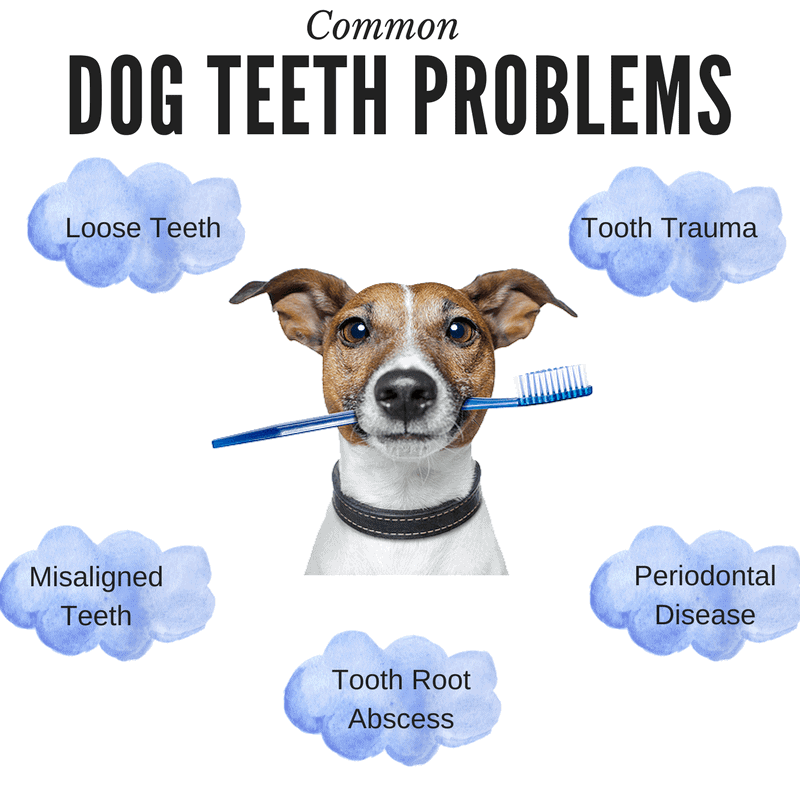 There are other problems such as cracked and crooked teeth, loose teeth, an abscess or a tooth infection that cause canines a lot of problems! And the worst part of it is that you may not even know that your dog is hurting! Well, it’s all in the genes. In the wild, showing signs of pain and discomfort would make a doggy vulnerable to getting attacked—and your doggy has the same instinct! So, how do you even determine that your pooch is sick? In this section of the blog, I’ll explain in detail all of the issues that surround your dog’s teeth. Did you know that pale gums in dogs can be a sign of internal bleeding? Loose teeth really aren’t a problem for puppies. This is because all of the teeth in their mouths usually fall off by the time that they’re six months old, like I’ve said before in this blog post. So, for puppies, you needn’t worry too much. I would recommend that you look into your puppy’s mouth once in awhile to see what’s going on. And, don’t worry! Puppies do retain their baby teeth in their mouth, they’re fairly common. When two teeth go on to occupy the same spot in your dog’s gum, it is time to go to the vet. The vet will help you get rid of the extra baby teeth so that the new, permanent teeth aren’t crooked and don’t cause problems in the future. Loose teeth are a major problem for adult dogs because they are a result of trauma that your dog might have taken to his mouth. A loose tooth could also indicate gum loss or advanced periodontal disease among other illnesses. I would highly recommend you to visit your vet at the first sign of a loose tooth. Your dog might need an x-ray so that your doctor can determine the cause of the loose tooth. In severe cases, dental extraction may even be necessary! Humans have it and so do dogs! It is a fact that some breeds are specifically known for their trademark bites, but when the situation is really severe, misaligned teeth can cause a lot of pain while chewing! And, your dog can even end up hurting himself every time he eats. Misaligned teeth can occur due to extra deciduous teeth in your dog’ mouth, or due to the misalignment of the upper or lower jaw. With the human beings that have misaligned teeth, we usually get them fixed by the orthodontist for that million dollar smile. But, obviously, for dogs, the looks really don’t matter—after all, every doggy is beautiful! If your dog does have a serious problem, the veterinary dentist will have to realign your dog’s teeth. Now, this doesn’t mean braces! Tooth extraction, or capping the problem tooth, etc. are some solutions that your vet will offer. Obviously, it all depends on a lot of factors! However, there is one more thing. If the vet determines that the tooth issue is genetic, your dog may be ordered to get spayed or neutered in order to protect dogs and safeguard the generations to come from this disorder. This, of course, depends on the region that you’re from. Did you know that does with misaligned teeth are more susceptible to other orthodontic diseases? Does your doggy friend leave spots of blood behind on his toys after playtime? Well, your dog’s chew toys carry a lot of clues regarding your dog’s oral health, so you should try to look through them to keep yourself in the loop. Periodontal diseases begin when the plaque present in your dog’s teeth turns into tartar which is a brownish substance that is known to move under the gum line and cause gingivitis or develop puffy and red gums. Well, when we leave gingivitis untreated, it progresses or turns into periodontal disease. This disease causes the gums to lose their function and recede, which makes tooth loss an eventuality. Other than that, this diseases also introduces infection which travels into the bloodstream of your doggy friend and causes infection all over. So, of course, the best possible way to fight off the periodontal disease is to stick to a good dental care routine. This includes a good brushing routine, good chew toys, and routine dental care check-ups. You should start this at a very early age so that your little puppy gets used to mouth handing and brushing, etc. If you see any signs of the disease, contact your veterinary dentist and get your dog checked up as soon as possible. Also, you can invest in getting your dog’s teeth professionally cleaned. But, you should try to keep an eye on what your dog chews for chewing the wrong object can wreak havoc on your doggy friend’s teeth and cause him a lot of dental distress! If that wasn’t all, solid and rigid objects are known to crack or break a tooth. And guess what? Your dog can also break his teeth by playing tugging games, rough play, or through impact injury! Of course, this doesn’t mean you shouldn’t let your dog have fun! Slab Fracture is a very common sight that you can see in a dog’s mouth and it occurs when a dog forcibly bites on a hard thing. This causes a section of your dog’s tooth to flake off which can cause a chip or a large gaping fracture. The problem with cracked or broken teeth is that the nerves become exposed—which in turn, causes a lot of pain to your doggy friend. In some cases, the nerve dies and the pain ultimately subsides. The broken tooth can get infected that can eventually result in a lot of pain! But, the good news is that this is totally avoidable. All you need to do is to keep a strict eye on your dog and take note of the things he chews on—not allowing your friend to chew on anything too hard. May sure that the chew toys that you get your dog are flexible and is as hard as a nylon or rubber material. After all, prevention is always better than cure! But, in case you do feel that your furry companion has a broken or cracked tooth, check in with your vet immediately—even if your dog isn’t bothered about it. There are a lot of treatments that can be done—depending upon the amount of damage the tooth has taken. But, as for the treatment goes, always go with what your doctor recommends. Bestpetguides.com have a handy guide if your dog won’t stop chewing his bed. A broken or fractured tooth can also lead to a tooth abscess. Let’s learn about that, shall we? This is one of the most agonizing dental health problems that your dog may experience. Tooth Root Abscess occurs when the root of your dog’s tooth becomes exposed to the harmful bacteria through a crack or a break. It can also be caused due to a gum damage as a result of periodontal disease. Sometimes, your dog’s eyes may also look inflamed due to tooth root abscess—this is because of the location of the infected tooth in your dog’s mouth. When you look inside your dog’s mouth, you should be able to find the infection as the infected tooth may have swelling, a lump, or may even be red. The abscess can even spread to the surrounding teeth making it difficult to determine which tooth is infected. If you see any signs of this, make sure to book an appointment with your vet immediately as it is very painful for your doggy friend. Other than that, your doggy friend will be given antibiotics to combat the infections and pain medication may also be given to help your doggy friend feel better during the treatment. We talked an awful lot about your dog’s teeth, didn’t we? Well, I really hope that I was able to cover all the important topics that I could. If you are looking for more information, please feel free to comment your questions and I’ll reply to your queries as soon as possible. A dog’s teeth are really important parts of your furry friend’s anatomy and they should be taken care of well. After all, your doggy needs them to do a lot of things! You should make a point to brush your dog’s teeth regularly and take your furry friend to the doggy dentist on a regular basis for optimal dental hygiene. After all, your dog’s teeth will take him a long way! If you know someone who can benefit from this article, please share it! And, let me know your thoughts in the comments section.